An Erie Manufacturing rail system is an efficient and affordable solution for storing and moving items though out your facility. 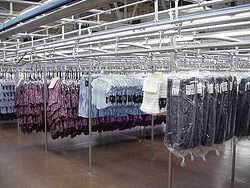 Our systems are most commonly used in the garment industry for GOH or "Garment on Hanger" storage and processing, but has been used in other industrial applications such as linen, painting, and greenhouses. Our rail systems use overhead trolleys that ride on a suspended rail. The system can be “free” hand or gravity driven --- or it can be "powered" by an affordable powered conveyor. The conveyor transports the trolleys over long distances or through inclines and declines to multiple buildings or storage levels to maximize space utilization and reduce labor costs. Erie's components support the following rail system features. Along with our standard product line, Erie manufactures components on a custom basis. Please write or give us a call. We will be glad to discuss your specific rail component needs.